A swift and savvy journey through 164 years of Alamo history—from lines in the sand to lines at the gift shop. Roberts (History/Purdue) and Olson (History/Sam Houston State Univ.) present a balanced analysis of one of the obsessions of the subject of their previous work (John Wayne: American, 1995). The first half deals with the brief battle itself (it was over in about 90 minutes)—its causes, its participants, and its immediate aftermath. 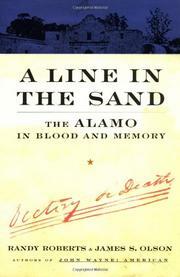 The second examines “how Americans gave and continue to give meaning to the event.” The authors provide fair and careful portraits of the principal players in the bloody drama: they characterize the Mexican general Santa Anna was “Byronic,” a man who “lusted for absolute power” and considered himself “Napoleon’s latter-day reincarnation.” William Barret Travis, the Alamo’s commander, read novels by Sir Walter Scott and, like many others at the time, employed “the rhetoric of the American Revolution.” Jim Bowie convinced Sam Houston the makeshift fortress could be defended—then died in his Alamo bed where he lay suffering from some devastating illness (perhaps typhoid). The most compelling and controversial figure, however, remains Davy Crockett, whose portrayals by Fess Parker and John Wayne have become part of the collective American imagination. Roberts and Olson consider the documentary evidence of Crockett’s life and death and conclude “there is no definitive account of Crockett’s final hours.” There are compelling chapters on the restoration of the structure, on Disney’s Davy Crockett phenomenon (which “must have made a dent in the raccoon population”), on Wayne’s meticulous but sluggish 1960 film (the set was cleared of rattlesnakes each morning), on the various academic interpretations of the Alamo, and on the structure’s continuing role as a lightning rod for political activists of all stripes. Although sorely in need of maps and other illustrations, this is an impressive, engaging analysis of one of the most politically charged events in American history.